Driving gear units｜Transportation Systems Products｜Transportation Systems｜Products Information｜Toyo Denki Seizo K.K. Driving gear units transmit turning force produced by the traction motor to the wheels. A driving gear set consists of all the components (axles, couplings, gears, etc.) involved in transmitting power to the wheel. 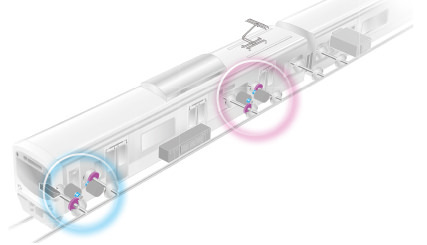 Driving gear units can be mounted in various ways and locations relative to the rail vehicle and can use varied mechanisms to transmit power to the wheels, but they are typically housed in a confined space under the body of rail vehicles. Regardless of the method, driving gear units need to be compact and highly reliable. Lubrication filling versatility: The lineup offers a variety of filling methods to meet the varying usage environments of regular, high speed and cold weather, etc. Low maintenance: Simplified adjustment of internal components as well as containment of lubrication leakage for reduced maintenance.